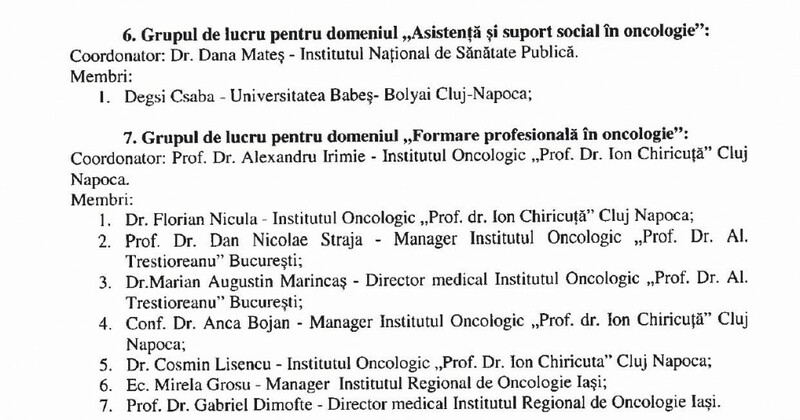 On 3rd of March 2016 the Romanian Ministry of Health named (OMS 236 din 2016 PNCC) the first (ever) Committee for Social Work and Support in Oncology (original name – Comisia Asistență și Suport Social în Oncologie) as part of the Steering Group to develop National Cancer Strategy 2016-2020. In 2013 the International Psycho-Oncology Society (IPOS) in joint efforts with the European Partnership for Action Against Cancer (EPAAC) launched the Psychosocial Oncology Action in Romania. The IPOS-EPAAC Task-Force chaired by Dr. Luzia Travado and supported by Dr. Maggie Watson has chosen Romania to receive the first EPAAC-WP7 workshop pilot-training on Communication Skills Training & Psychosocial Oncology Care, hosted at “Prof. Dr. Ion Chiricuța” Institute of Oncology (IOCN), Cluj-Napoca, Romania. The final report of this action was sent to the Oncology Commission of the Romanian Ministry of Health together with a requisition for setting up multidisciplinary teams in comprehensive cancer centers and implementing psychosocial oncology care in oncology institutions and other regional and county-level centers. 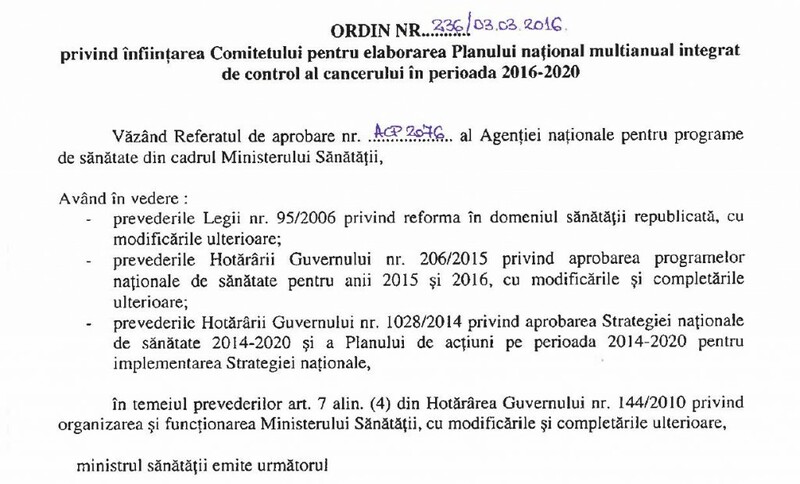 Based on this initiative, on 3rd of March 2016 the Romanian Ministry of Health named, trough Ministry Order No. 236, the first national Committee for Social Work and Support in Oncology and the first subcommittee for Psycho-Oncology, as part of the working group to develop the National Cancer Control Plan for 2016-2020. IPOS’s representative for Romania was appointed as a single member for the Committee for Social Work and Support in Oncology, and two IPOS trainers from Romania were invited to the subcommittee for Psycho-Oncology. The Romanian Association for Communication and Services in Oncology (APSCO) and representative patient organizations were involved in consultations about psychosocial recommendations presented to decision-makers in the Ministry of Health and its authorities. For a prerequisite, on 22nd of March 2016 at the Romanian Senate an Inter-Institutional Pact on Multidisciplinary Approach in Fighting Cancer was presented by the Public Health Commission, and Commission for Human Rights, Religions and Minorities. It is to be signed soon as the new National Cancer Control Plan is expected to be launched in mid April.